Featuring never-before-exhibited photographs of Fred Maroon and Philippe Bréson, the show offers a narrative of the environmental and social changes that swept through Europe after World War I and II. Artist’s Proof showcases how photographers Fred Maroon and Philippe Bréson offer a narrative on the changes that swept through Europe after World War I and II in the exhibition, “Through the Lens: Visions of Post-War Europe.” This exhibition will be curated by the distinguished Will Stapp who was the founding curator of the photography collection of the National Portrait Gallery. Each photographer employs a carefully developed visual language to express the healing from scars left behind by each conflict. While Bréson focuses on the topographical ruptures in Europe’s landscapes left from the artillery shelling and trenches of World War I, Maroon’s 1950 and 1951 collections aimed to depict European society during a period of recovery from the ravages of World War II. 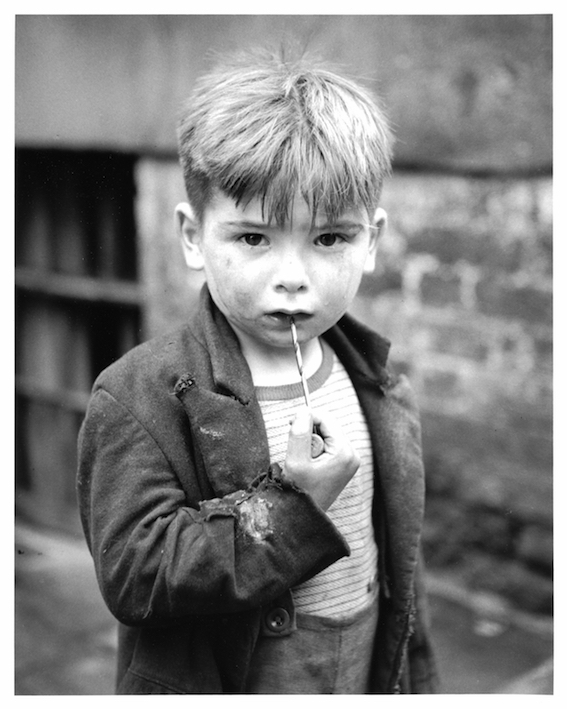 Fred J. Maroon (1924-2001) is described as one of the finest photographers of his generation. His career spanned more than half a century and touched on topics ranging from fashion, architecture, landscapes, photojournalism, and politics. This exhibition of his post-WWII photographs have never been shown as a collection of works and the exhibition seeks to tell the story of his travel through Europe as a stringer for Life Magazine. The people and places are seen through the eyes of a young American war veteran, fresh out of university, curious yet unsophisticated, as he intuitively reacted to the scenes he witnessed. In addition to the numerous awards garnered during an impressive career, Maroon’s works are featured in the permanent collections of the Museum of Modern Art, the Metropolitan Museum of Art, the International Center of Photography, and the Library of Congress. 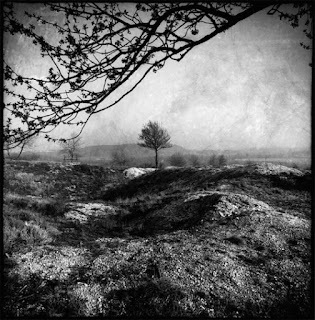 Unlike most contemporary photographers, Philippe Bréson works in an antiquated silver gelatin process, requiring him to develop each photograph manually, and often build his own cameras manually. An experienced photojournalist, Bréson has also taught photography in various art institutes in Paris. Featured in the Beaux Arts Magazine, Bréson has exhibited since 1986. His dive into “memory” as a theme is colored in the same ways as his explorations into portraiture, architecture, and underground sexuality. His works appeal to a vintage aesthetic. Based out of Paris, this is the first release of the artist’s work in the United States. Images: courtesy Artist's Proof Gallery. Greetings! We hope you had a great season and are continuing the holiday celebrating. 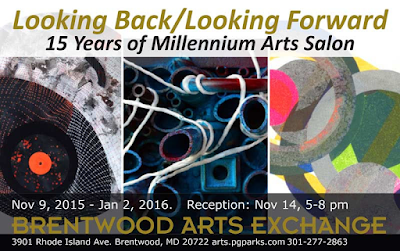 We are in the last three days of the exhibition, Looking Back/Looking Forward at Brentwood Arts Exchange (BAE). 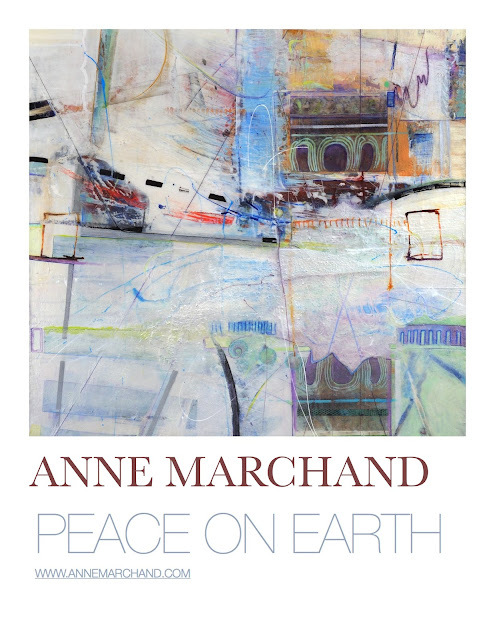 You can end the year or start a fresh one with a visit to see this exhibition. Either way is good! Here is a nice review of the show featured in East City Art in case you didn't see it. Please feel free to send your colleagues and friends to visit the exhibition before close of day on Saturday, January 2. 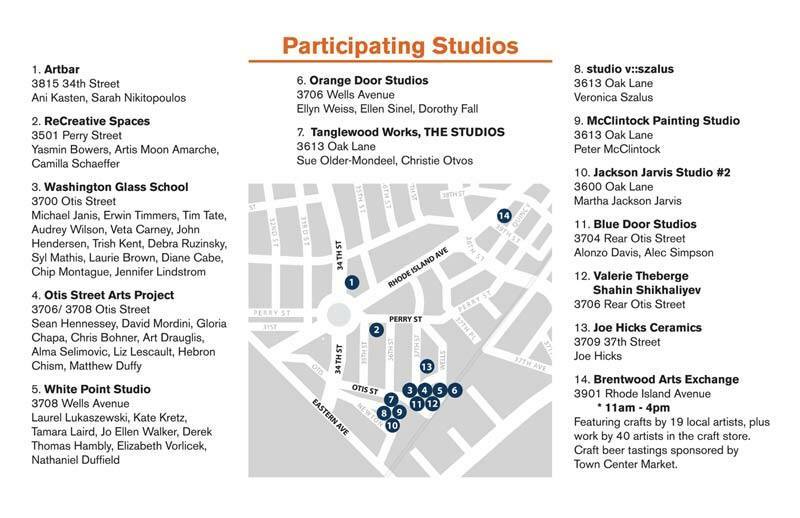 Brentwood Arts Exchange is open 10 am - 7 pm on Wednesday, and 10 am-4 pm on Thursday and Saturday, (closed Friday for the holiday). Celebrating 15 years of Millennium Arts Salon, the exhibition features artists: Holly Bass, Joan Belmar, Anne Bouie, Wesley Clark, Hediech Ilchi, Wayson R. Jones, Anne Marchand, E.J. Montgomery, Ellington Robinson, Sheldon Scott, and Stan Squirewell. Looking Back/Looking Forward is co-curated by Jarvis Dubois, Janell Blackmon-Pryor, and Sharon Burton. This exhibition commemorates Millennium Arts Salon's (MAS) commitment to art and culture in the Washington, DC area for over fifteen years. Participating artists featured in this exhibition foster the dialogue between cultural consciousness, social expectations, and human emotion. Abstract forms, fictional characters, and symbolic representations give us an entry point to an open-ended exchange about human connectivity. The District of Columbia Arts Center will be closed on Christmas Eve and Christmas Day, as well as New Year's Eve and New Year's Day. Pressure points are vital points that when engaged, release energy and organize a system of communication throughout the body. In this exhibition, artists use oil and acrylic paintings, multimedia collages, and ink on paper to look at society's pressure points and the external systems which cause internal stress, congestion, ache and fatigue. The visual analysis is not a protest, or the application of pressure, but instead the energy release that compresses tension and creates dialogue, relief. The small paintings in Singles Faire: Intimate Gestures were created on New York City and Washington, DC transit fare cards, and paper ephemera. These bits of paper intensify metaphors of passage and journey from their original intentions as fare cards to works that develop layered meanings in body language. A variety of techniques including media transfer, watercolor, and drawing were used to create these works into awkwardly humorous views into the lives of singles. 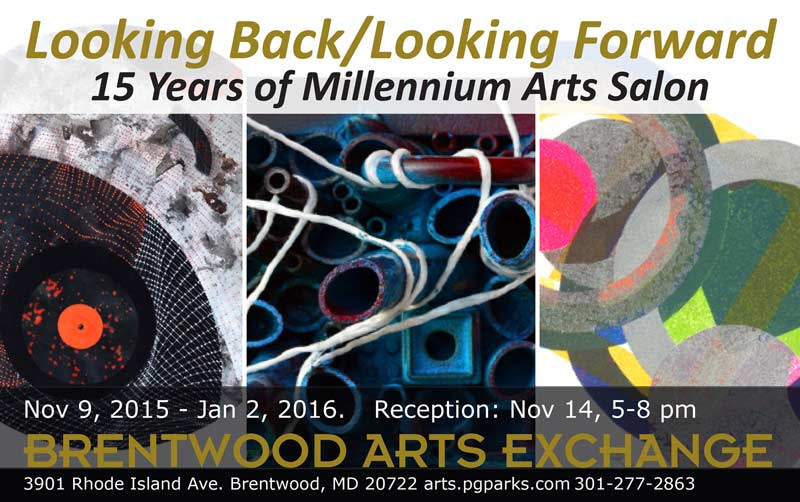 Brentwood Arts Exchange in the Gateway Arts Center is featuring eleven artists from the DMV area exhibiting large scale work in "Looking Back/Looking Forward". I’m excited to be one of the exhibiting artists in this very cool show! It's co-curated by Jarvis Dubois, Janell Blackmon-Pryor, and Sharon Burton. 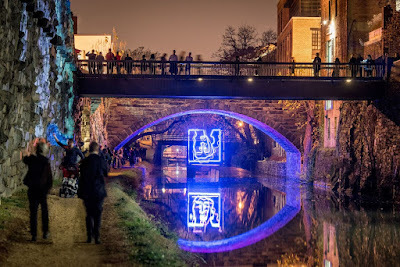 Washington, D.C. (December 2, 2015) – Five local, regional, and international artists will show commissioned light-art works inspired by the historic C&O Canal during the second annual Georgetown GLOW exhibition in Georgetown. In its second year, GLOW will expand from a weekend-long celebration to a 10-day exhibition from Friday, December 11 – Sunday, December 20 with works lit nightly from 6-10 p.m. In addition to the light works, GLOW 2015 includes an Artists’ Talk on December 12, live entertainment, store promotions and more. Georgetown GLOW is a signature winter event celebrating the holiday season organized by the Georgetown Business Improvement District (BID). Visit www.GeorgetownGLOWDC.com for announcements and updates. 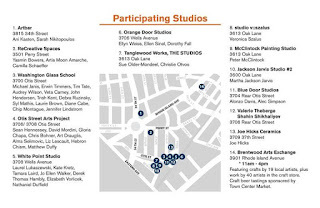 Artists represented in Georgetown GLOW 2015 include: Laia Cabrera and Isabelle Duverger (New York, NY), Arthur Gallice and Hervé Orgeas (Shanghai/Washington, D.C.), the collective SHO + ULR (Pittsburgh/Gainesville, FL/Boston), Kelly Towles (Washington, D.C.), and Hiroshi Jacobs of the trans-disciplinary research and design collaborative HiJAC (Washington, D.C.). The group of five artists represent a diverse mix of backgrounds in artistic lighting design, sculpture, architecture, street art, video mapping, and film. This year’s exhibition encourages contemplation of, and interaction with, the natural and built environment. 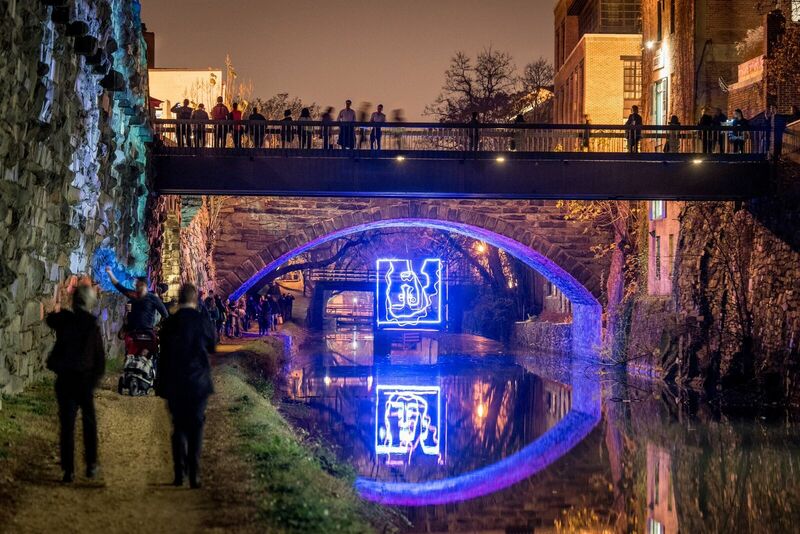 The intimate, historic C&O Canal—a beautiful, meditative waterway reminiscent of Georgetown’s founding as a port town and located just steps from bustling M Street—is the anchor and inspiration for the site-specific works. The C&O Canal, the “spine” of Georgetown, was erected in 1828 to carry goods westward. Today, it is a National Park Service property and a destination for recreation and respite. Visitors are encouraged to reflect as they are transported. Over both weekends during Georgetown GLOW, visitors will enjoy nightly live outdoor musical performances from 6:30-7:30 p.m. on the lawn of Grace Church (1041 Wisconsin Avenue). Additionally, visitors shouldn’t miss a visit to Washington Harbour for a spin on the region's largest outdoor ice skating rink. Georgetown’s holiday décor and lights make it one of the city’s most festive neighborhoods during the holiday season. As attendees tour the public art works, they are also encouraged to take a self-guided tour of the uniquely decorated merchant windows in the fourth annual Holiday Window Competition, in which fourteen Georgetown merchants--mainly small and regional businesses--square off in a friendly competition to win top holiday decor honors. Visitors vote for their favorite store window by "liking" its photo in an album on Georgetown’s official Facebook page. The winner is crowned on December 21, the day after #GeorgetownGLOW comes to a close. Visitors can pick up programs/maps at Georgetown GLOW information booths located at the following locations, December 11-13 & December 18-20 from 6-10 p.m.: Grace Church (1041 Wisconsin Avenue), Jefferson Court (1025 Thomas Jefferson Street at K Street), and Pinstripes (1064 Wisconsin Avenue). For event information anytime, visit www.GeorgetownGLOWDC.com. Visitors to GLOW are encouraged to follow Georgetown on Twitter (@georgetowndc), Facebook (https://www.facebook.com/OfficialGeorgetownDC/) and Instagram (@officialgeorgetowndc), join the event on Facebookand participate and share via the hashtag #GeorgetownGLOW. Shifting Gaze: A film Installation about Choice, Desire & Memory, Laia Cabrera & Co. (Laia Cabrera + Isabelle Duverger), New York, NY. Shifting Gaze is a film-art-music installation about choice, desire and memory conceived and directed by Laia Cabrera (filmmaker and video artist) and created in collaboration with Erica Glyn (music, composer and singer) and Isabelle Duverger (animation and mapping). Shifting Gaze is a film about identity, about making choices, a memory in act. Drawing from the body, faces, urban patterns, nature and remains of activity, the piece explores a notion of choice, linked to desire and memory - choice being the present, memory representing the past and desire, the drive for a future. Underneath these mirrored imageries lie many stories about limits, freedom and self-perception. WIRED People Project: The Lovers, Arthur Gallice & Hervé Orgeas, Shanghai/Washington, D.C. Drawing inspiration from calligraphy and its philosophy, WIRED People Project: The Lovers is a series of portraits that are hand-drawn with uninhibited brushstrokes expressing an emotion caught in time. This series has been developed in both print and sculpture. For Georgetown GLOW, Orgeas and Gallice have worked closely to introduce an experiential, lighting element to the sculpture. The result is an installation that tells the story of two lovers who meet each other at night…under the historic Wisconsin Avenue Bridge (Washington’s oldest bridge). Inspired by swaying prairie grasses, Intr(ə)Scapes is an interactive light installation that invites visitors to explore and immerse themselves within its dynamic lightscape. A total of 480 eerie, glowing acrylic stalks are lit by RGB LEDs embedded within a CNC-fabricated synthetic landscape. Tracked via an infrared imaging system comprised of custom hardware and software, visitors’ movements are reflected in waves of colored light animations that shift and churn with every step. The inherent flexibility of the acrylic stalks helps them to react naturally to self-weight, air movement, and human touch, embodying and tracing the kinetic energies and latent forces present within the environment. A Happy Place, Kelly Towles, Washington, D.C. Note: This work will be shown from 7-9 p.m. nightly. Towles, an artist known for his colorful, large-scale murals whose work has been shown at Washington’s David Adamson Gallery and in commissions throughout the city, ventures into video and light projection with Happy Place. The work is an animated version of the artist’s world, bringing to life his creative processes and transforming his typically painted works into motion and form. The work marks a new interaction with Towles’ “canvas” of facades, windows and walls, and invites viewers into his Happy Place. iGlow, HiJAC (Hiroshi Jacobs), Washington, D.C.
iGlow is a corridor of light that puts its occupants on display, pixelating their image to express an analog digitization of motion. The corridor is lined with lights on one side and a perforated screen on the other. As you make your way through, the sculpture’s exterior translucent surface displays the activity within. The commotion of activity inside creates an ephemeral expression of life on the outside. Saturday, December 12, 4:30-6 p.m. Doors, 4:30 p.m.; program begins at 5 p.m.
Hickok Cole Architects, 1023 31st St., NW. Meet & greet with the 2015 Georgetown GLOW artists and learn about their light-art installations. This program is FREE and open to the public; space is limited and RSVPs are suggested at www.GeorgetownGLOWDC.com. The Georgetown Business Improvement District (BID) recognizes the following sponsors for their generous support of Georgetown GLOW 2015: The JBG Companies, Jamestown/Georgetown Park, The Washington Harbour Ice Rink, HOK Architects, Hickok Cole Architects, AIR (American Institutes for Research), RB Properties, Inc., Sea Catch Restaurant, Jaguar/Land Rover, The Georgetown Current Newspapers, Grace Episcopal Church, Georgetown Suites, and Think Out Loud Productions. The Georgetown Business Improvement District (BID) is a nonprofit organization dedicated to protecting and enhancing the accessibility, attractiveness and overall appeal of Georgetown. Established in 1999 by its property owners and merchants, the Georgetown BID has more than 1,000 members. The organization is located in the heart of Georgetown in Washington, D.C. and sets a standard of excellence in preserving historic charm while meeting contemporary needs. From marketing and special events, to transportation, economic development, destination management and streetscape, the Georgetown BID contributes to the vitality and quality of life in Georgetown. For more information, visit georgetowndc.com. Jason Peters, The Glow at Jefferson Court (2014). Photo Sam Kittner/courtesy of the Georgetown BID. Laia Cabrera, Shifting Gaze. Rendering courtesy of the artist. Arthur Gallice and Herve Orgeas, WIRED People Project: The Lovers. Rendering courtesy of the artists. SHO + ULR, Intr(e)scapes. Rendering courtesy of the artists. Kelly Towles, Happy Place. Image courtesy of the artist. Hiroshi Jacobs, iGlow. Rendering courtesy of the artist. 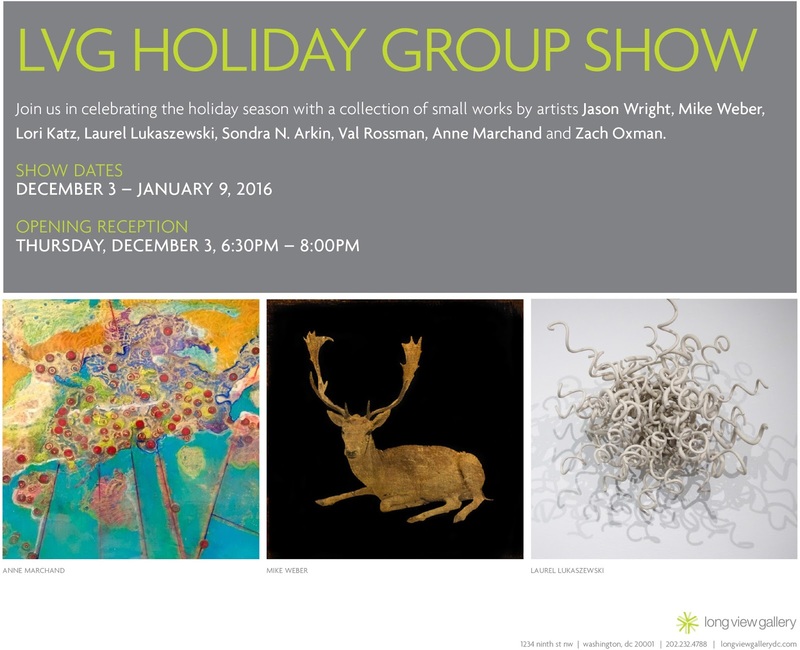 Join us in celebrating the holiday season with a collection of small works by artists Jason Wright, Mike Weber, Lori Katz, Laurel Lukaszewski, Sondra N. Arkin, Val Rossman, Zachary Oxman and Anne Marchand.